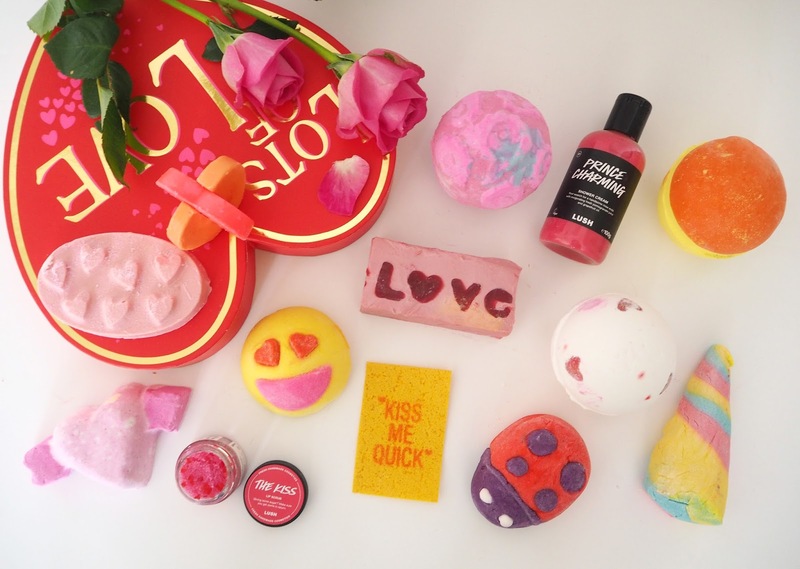 Today I am bringing you a look at Lush's Valentines Collection for 2017. 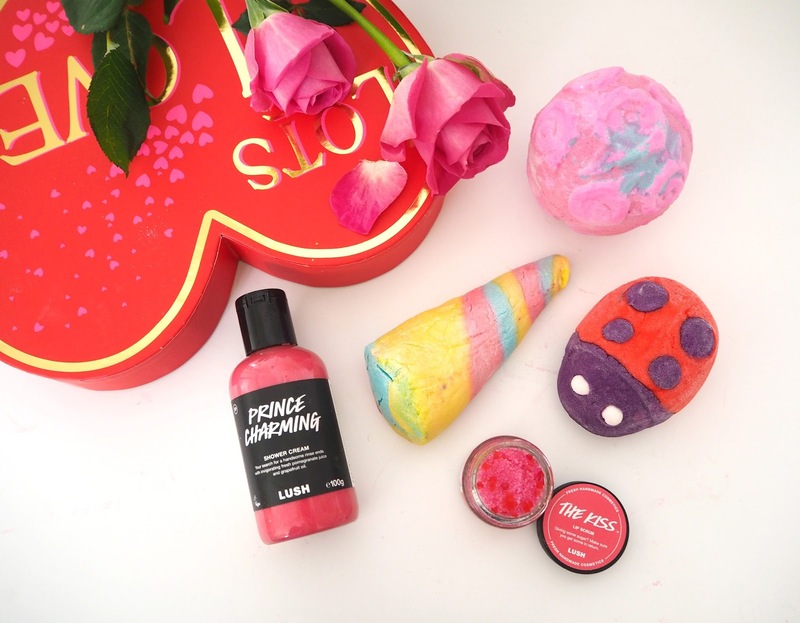 Looking back at my post from last year (Lush Valentine's 2016) it's interesting to see how much they have expanded their range, from just 7 products last year to 14 now! I think this might be my second favourite seasonal range from Lush (after the Christmas one!) because it includes some of my all time favourite products from the brand that of course we only have access to once a year plus, being the cliché girlie girl that I am, I'm draw to all the pink, red, hearts & flowers! There are some fantastic options to choose from this year, including 5 fab gifts sets, so whether you're buying for a loved one of simply want to try some of the newbies yourself here is my guide to the entire range! So here is my haul! An incredibly pretty and colourful selection we have this year. 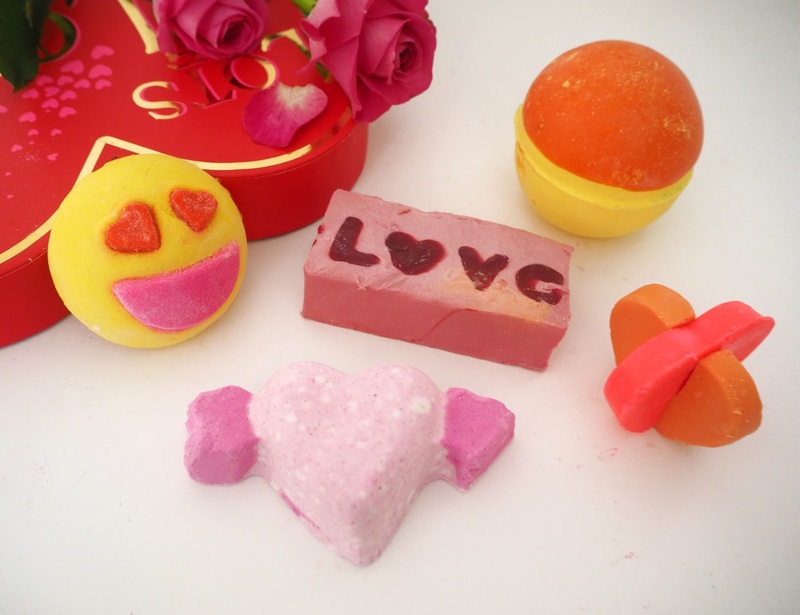 Love You, Love You Lots Soap | What a beautiful soap! Mine came in the Lots of Love gift box so as you can see it has LOVE on it which I think is super cute. However it's worth baring in mind when you buy this outside a gift set you will get a chunk cut from the giant one so it will just have one letter or perhaps a heart. It's smells delightfully of rose oil! "Shower in them, bathe in them, uplift your mind, body and soul with them - nothing beats a rose to show you feel the throws of passion, and there’s four kinds in this luxurious lather. Rose petal infusion, rose oil, rose syrup and even fresh rose petals find their way into this love potion to give you a blooming good clean. Can you feel the love? You can now." 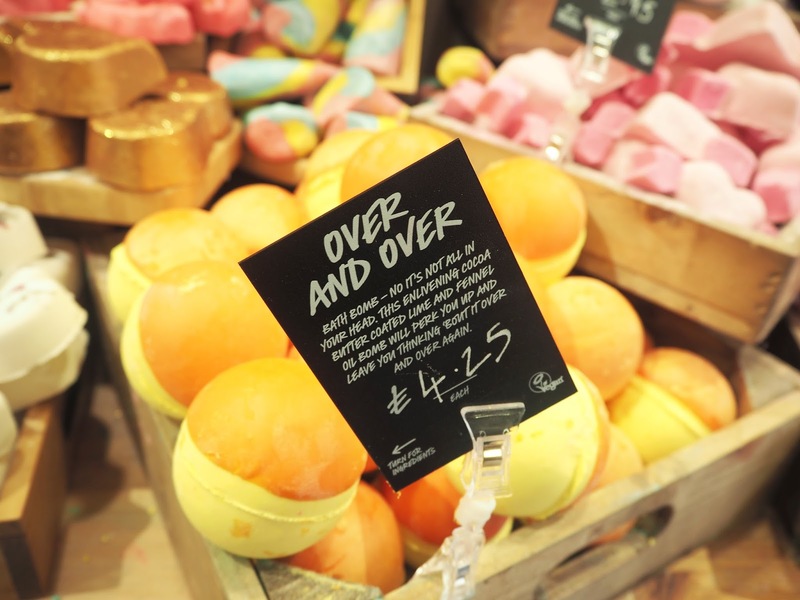 Over and Over Bath Bomb | Remember Never Mind The Ballistics from the Christmas range? Well this one is similar in the half is super moisturising cocoa butter and the other half is fizzy bath bomb! Bright and citrusy in scent I found this really awakening and enlivening plus is creates beautiful yellow, orange and pink bath art! "No it’s not all in your head. This enlivening cocoa butter coated lime and fennel oil bomb will perk you up and leave you thinking ‘bout it over and over again. Be mesmerised by its hypnotic rocking and rolling, as a vibrant citrus firework of pinks, oranges and golds unfurls into your bath." 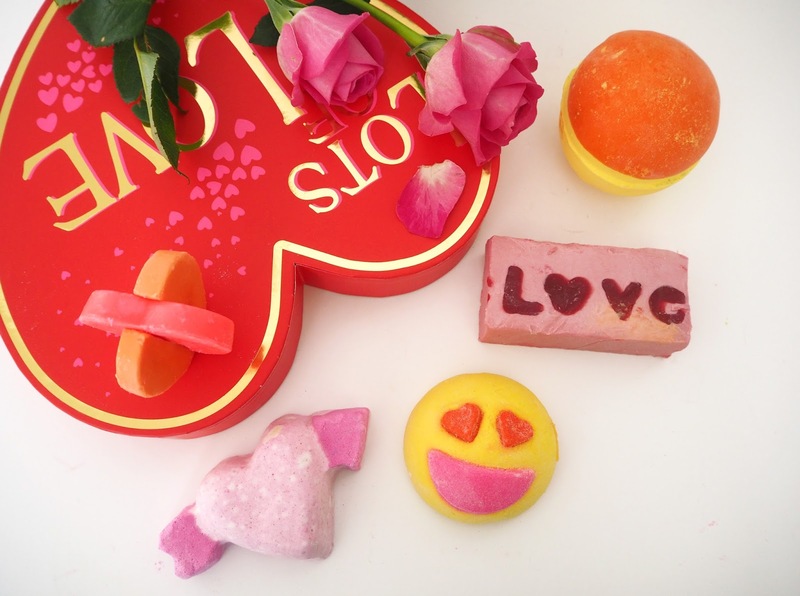 Lovestruck Bubble Bar | How cute is this heart-eyed-emoji Bubble Bar?! I have yet to actually use this one myself but it seems to be a love it or hate it scent amongst the Lush Community - a divisive one! If you've tried it let me know what you think. "Words can't describe how much you love them, but emojis filled with lemon and geranium sure can. If you heart bubbles, crumble under running water - you're sure to Like the result. Warning: These refreshing citrusy suds may make you feel Emoji-nal!" 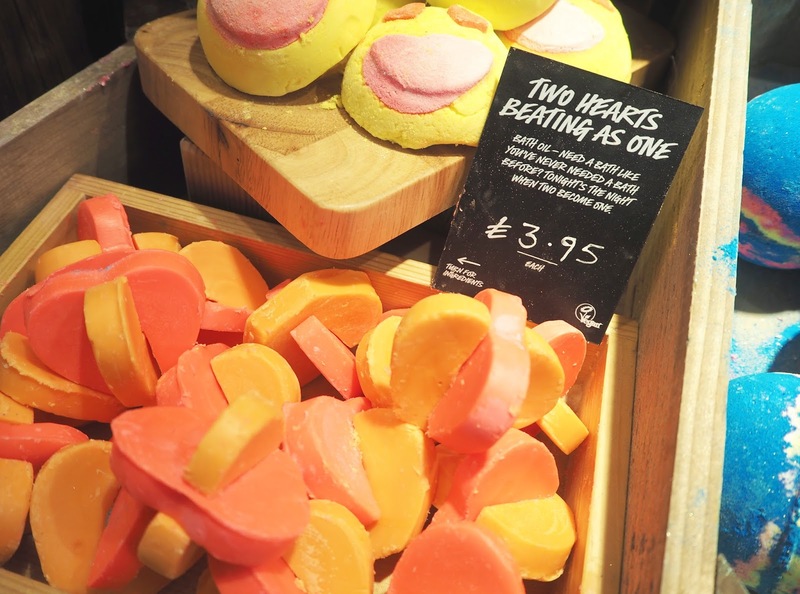 Two Hearts Beating as One Bath Melt | With a seductive floral aroma this is a delightful new addition to the Valentines family. Lush Bath melts are perfect for when you're skin is feeling dry and flaky because it's pure oil (but don't worry not greasy) leaving you skin feeling nourished. You could easily make this last 2-3 baths by breaking it up! "Need a bath like you’ve never needed a bath before? Had a little bath, but now you’re back for more? Tonight’s the night when two become one! So set your spirit free with a union of ylang ylang and rose oils, and be mesmerised as they dance their dizzyingly floral first dance in your bathwater. And, while all eyes are on the coral and magenta magic unfurling in your tub, an entourage of softening organic cocoa butter and almond oil will bestow your body with a conditioning caress." 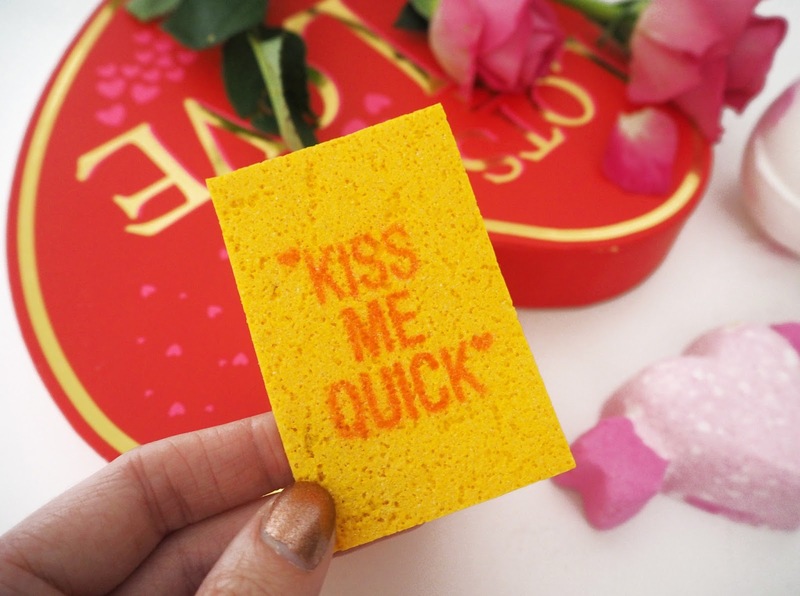 Kiss Me Quick Wash Card | This is such a cute little idea! A wash card that is as small as a business card, simply tear a little off and rub into a lather in the shower. It doubles as a shower gel and shampoo so absolutely ideal for slipping in your overnight bag! It shares its scent with 29 High Street so if you're familiar with that and love it then you'll love this. "Hold this floral fresh apple pulp wash card close and let the enzymic oil of brightening lemons and limes accompany you, naked, into the shower. How do I do it, you ask? It’s easy-peasy, lemon-squeezey! Lather up with this soapy-sheet, bursting the bubbles all over your body! Rinse off, and nothing but fruity fresh, soft skin awaits you. Refreshing and uplifting to a tired mind, super handy for sharing, travelling and works fantastically as sweet-scented shampoo too. Perfect for anytime, anyplace, any body! Ylang-ylang will help any tiredness or anxiety dissipate and you’ll head into your day feeling joyful and raring to go." 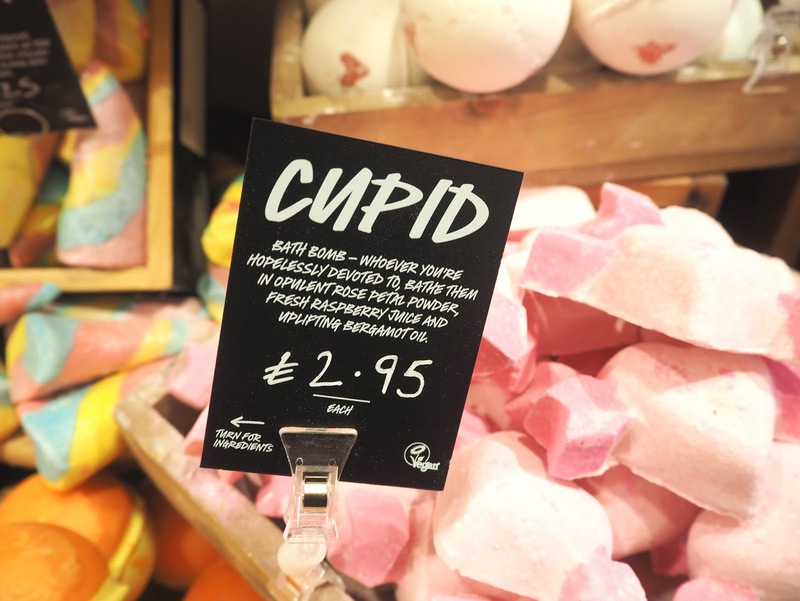 Cupid Bath Bomb | I think this is my favourite of all the new additions to the range this year! Not only does the little pink Cupid symbol look adorable but it smells beautifully of raspberry simile to the Razzle Dazzle Bath Oil and it's a bargain at only £2.95! "Be still your beating heart with an opulent bathtime bouquet of calming rose and bergamot. This fantastically floral fizzer is full of uplifting bergamot, rose and violet leaf absolute, and its subtle sweetness is sure to melt your heart as it melts into your bathwater." Prince Charming Shower Cream | Your search for a handsome rinse ends here. Whether you’re awaking from a particularly long slumber or prepping for the ball of the century, sweet marshmallow root and vanilla pod infusion will sweep you off your feet. And who needs a shoe as a souvenir? Invigorating fresh pomegranate juice and grapefruit oil will linger on skin for longer than any glass slipper could last. "Your search for a handsome rinse ends here. Whether you’re awaking from a particularly long slumber or prepping for the ball of the century, sweet marshmallow root and vanilla pod infusion will sweep you off your feet. And who needs a shoe as a souvenir? Invigorating fresh pomegranate juice and grapefruit oil will linger on skin for longer than any glass slipper could last." 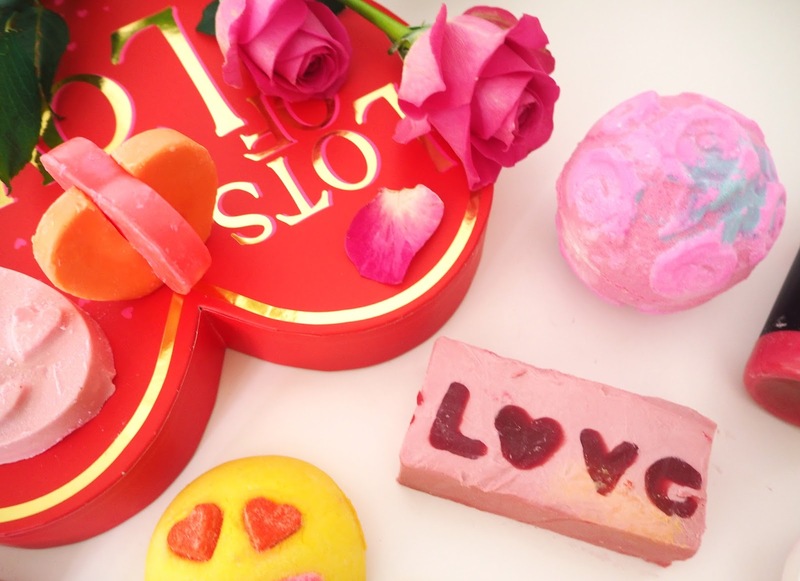 Love Spell Massage Bar | Ooh what a lovely treat for Valentine's night! I haven't tried many of Lush's massage bars but you can basically use them as a solid body oil, it will melt as it warms to your skin. This one not only looks gorgeous but smells divine too! "Follow your heart straight to this creamy, Fair Trade, organic cocoa butter bar, filled with rich rose hip syrup and spicy carnation absolute. Fair Trade organic aloe vera gel soothes your blushes while uplifting neroli and organic lemon myrtle takes you to a higher plane. Cast a spell over a skin, or over a partner, with this romantic, floral bar." 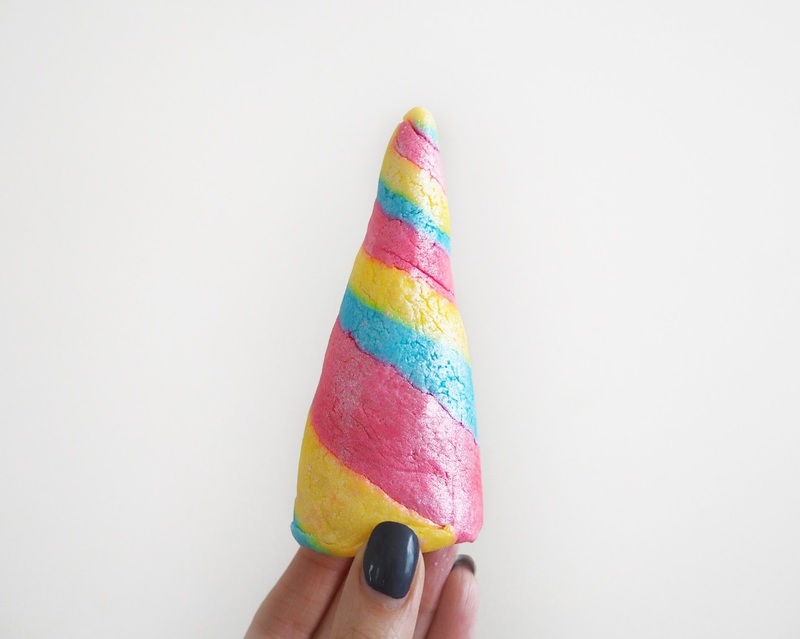 Unicorn Horn Bubble Bar | Ahhh one of my all time favourite Lush products!! It's not just me either, millions of fans wait to stock up on this baby each year. Not only does it represent the best magical, mythical creature there is but is it gorgeous to look & it smells heavenly too. Come on Lush just release this into your permanent range, it would make me so happy! "Unicorns are probably real. But, even if they're not (don't worry they definitely are) you won't mind! Relaxing lavender oil meets mood-brightening neroli in this lustre-filled bar. Neroli oil increases serotonin levels in the brain which makes us feel contented and cheery, so you can ponder the existence of magical creatures while building a fairytale landscape of feel-good, fragrant bubbles." 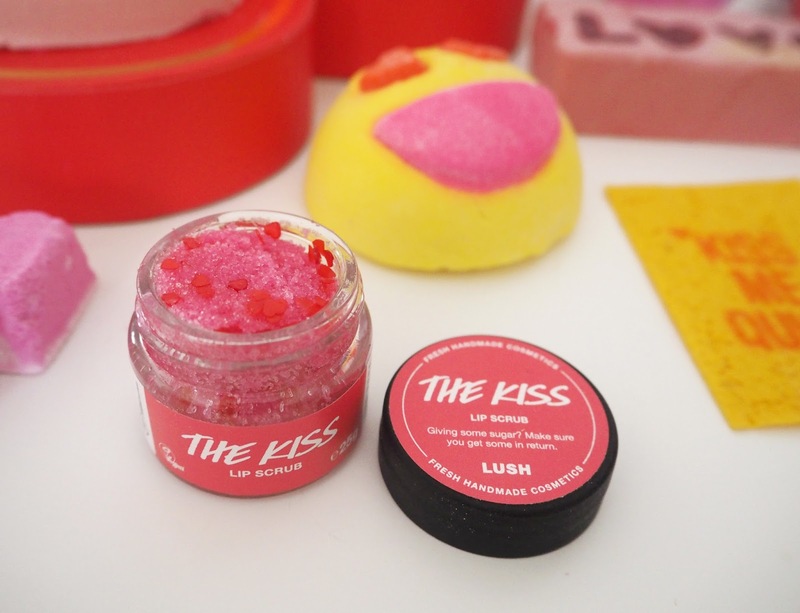 The Kiss Lip Scrub | I have a bit of a thing for Lush's lip scrubs! Let's face it all their products smell good enough to eat but they are the only products that you can actually taste (as well as the lip balms) without making yourself ill! I think I've tried almost every single one so far, I have a draw full and use one every other day to keep my lips soft & smooth. This one smells like a delicious bag of fruit sweeties. It does contain a little bit of sea salt though so just be careful about eating too much! "Giving some sugar? Make sure you get some in return. This smoothing blend of fine sea salt, caster sugar and Fair Trade cocoa butter will soften the skin and leave a delicious taste on the lips. A little almond and mandarin oil sweetens, and the edible hearts? They're just for your enjoyment. Savour it all to yourself or share with your Valentine." The Kiss Lip Balm | Although this is the only product not in the photo I did buy it last year. The balm is lovely with a hint of pink colour and it smells & tastes delicious! "Kisses are so much sweeter when they're infused with Fair Trade shea butter from the Ojoba women's cooperative in Ghana. This soft, hydrating butter will moisturise your skin, while Kalahari melon and organic jojoba oils add a touch of the exotic. Organic illipe oil and agave syrup give a lovely slip and delicious shine to your lips too. Who could resist?" 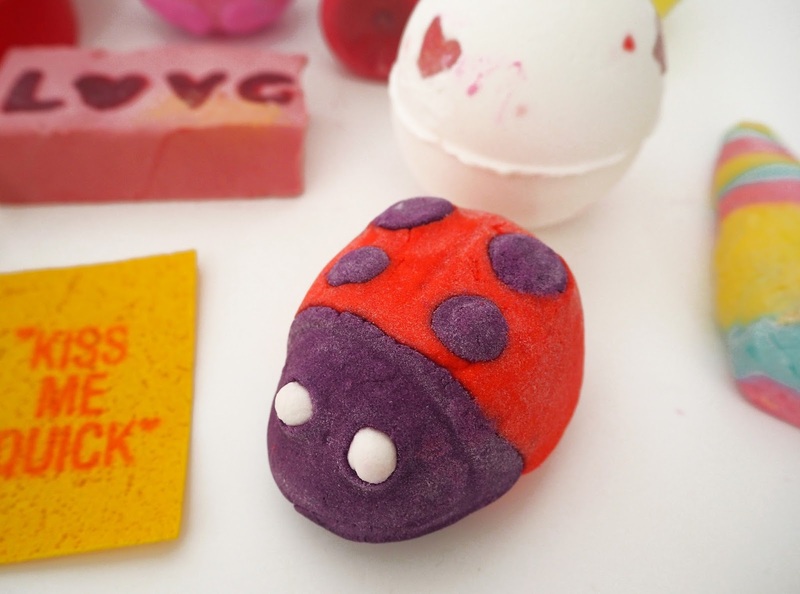 Ladybird Bubble Bar | I'm so happy this Bubble Bar is back again this year! It was in the Mother's Day Collection last year but I think the colours and fragrance fit perfectly in with the Valentine theme - love bugs! The bubbles from this little cutie are amazing and it smells literally incredible, to me like strawberries even though the main oils in it are geranium and peppermint it seems to create strawberry!! "Ladybird, ladybird, fly away home! and fill up the bath with geranium foam. This friendly little ladybird wants to take you under its wing and run you a hot floral bath, filled with sweet geranium oil to aid relaxation. A little peppermint oil gives a menthol hint to this flowery mix, helping to revive and uplift mind and body as you soak. Go all out for mountains of cheery bubbles or save a little for next time." 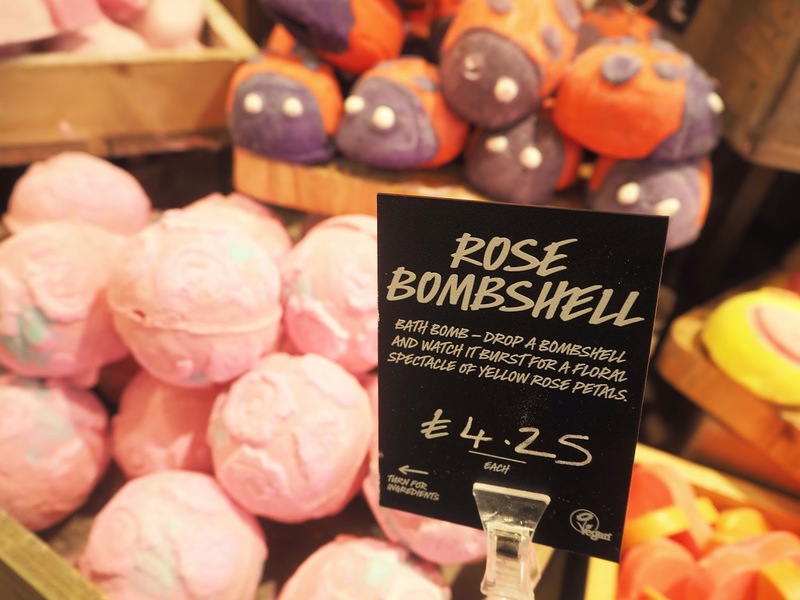 Rose Bombshell Bath Bomb | This Bath Bomb is another one that has made its way over from the Mother's Day Collection last year to the Valentines range this year. 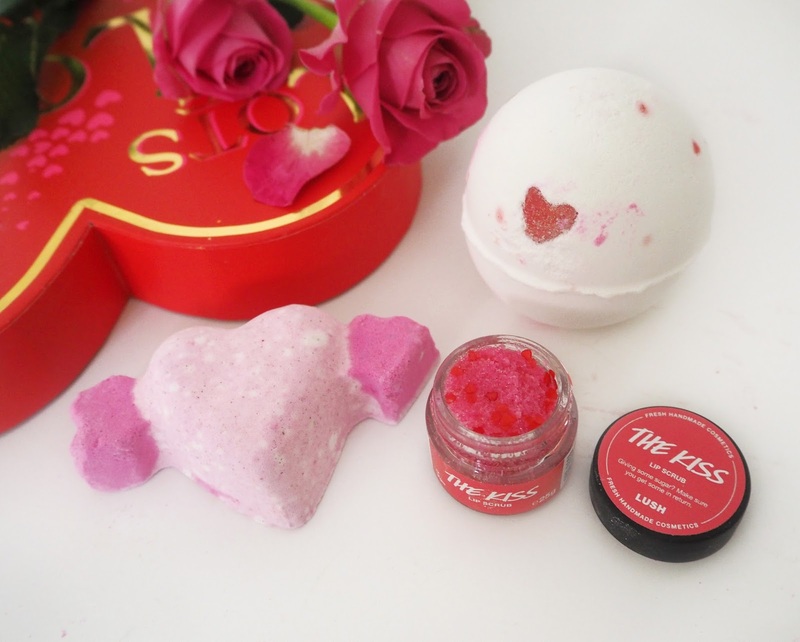 If you adore the Rose Jam scent from Lush then this is perfect for you! It's an intensely sweet and slightly fruity blend of raspberry and rose. Also this bath bomb releases yellow rose petals from inside it, delightful! "Love is blind, which is a shame because this bombshell with a floral triplet of yellow rose petals, rose absolute and rose oil is an enthralling spectacle. As it fizzes, the outer shell breaks away and magnificent petals burst out in a sweet haze of Sicilian lemon and floral geranium oils." Lover Lamp Bath Bomb | I remember really enjoying this one last year so I can't wait to try it again. 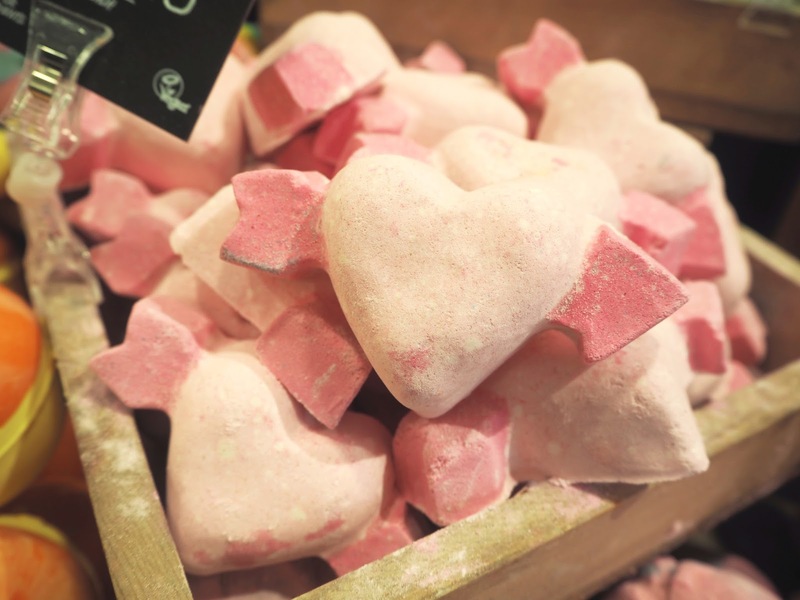 The little red cocoa butter hearts scatter their way throughout the water creating the most romantic bath ever! 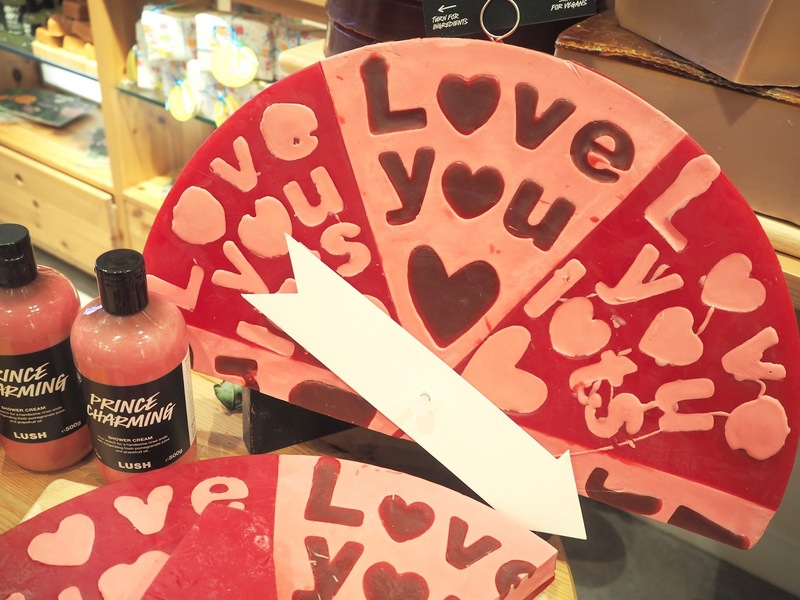 "However your V Day pans out, you can rely on this amorous organic cocoa butter embrace to melt your heart and soften your skin. 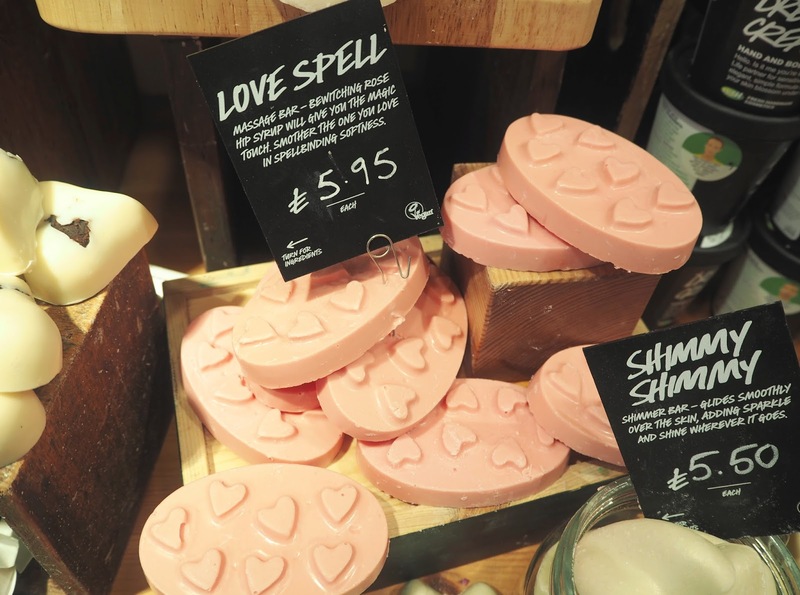 As vanilla absolute and Brazilian orange oil sweet nothings are whispered into your bathwater, cocoa butter hearts unfurl to envelop you in a romantic rendezvous - cleansing climax guaranteed." Top left clockwise: In Your Dreams (£9.95), With Love (£11.95), Love & Kisses (£24.95), Lots of Love (£39.95), Happy Valentine's Day (£19.95). Gift Sets | There is a fantastic choice this year for gifts sets depending on your budget. As you can see by the lid featuring in my photos I have already gifted to myself the Lots of Love set! It's the biggest of all the choices with 7 products all from the Valentines range and costs £39.95. I think it's well worth it plus I'm planning on using the box for storing products in afterwards! As an alternative gift idea I think buying one of their pretty knot wraps (such as this one) and wrapping a bath bomb inside would make a lovely little gift, and the knot wrap can be used as a scarf afterwards too! You can buy shop the collection online here but I would advise going into stores if you want things in time for Valentine' Day. Be sure to stock up whilst you can as these beauties will start to dwindle from the shops after Valentine's Day to make way for the Mother's Day Collection - it's a busy time for Lushie's!! 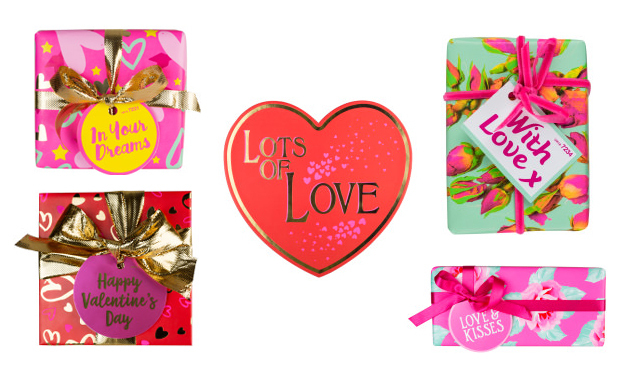 What are your favourites from the Valentine's Day range this year? The ladybird is so cute!! I love the idea of a wash card - i'll definitely be picking one up for when i'm next going on holiday!